View More In Tabletop Scenes - Page 2. Recreate the story of The Nativity with this realistic hand-crafted soft sculpture. Unbreakable fabric pieces allow children to play and learn. 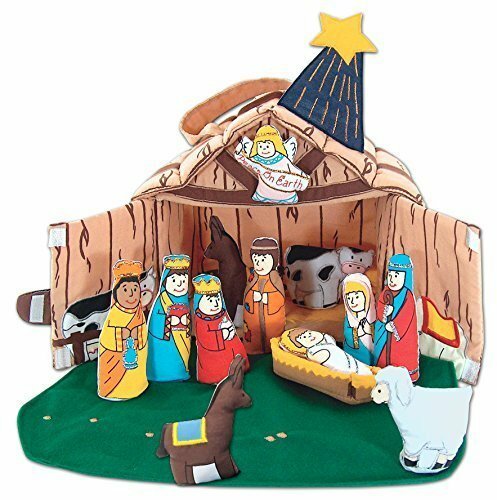 The set folds into the sturdy fabric stable with handles and includes: Mary, Joseph, Baby Jesus, a straw manger, 3 Wise Men, a shepherd, a donkey, a sheep, a cow and an angel. Child's first Nativity Manger Set is made from fabric with safe unbreakable pieces. All the pieces store in the sturdy stable with a Convenient handle for travel. Just the right size for toddlers- lost pieces are replaced free. This Unique Manger set is hand-crafted with the quality that only Pockets of Learning provides. Manufacturer: Soft Skills Learning Products, Inc. Publisher: Soft Skills Learning Products, Inc. Studio: Soft Skills Learning Products, Inc. If you have any questions about this product by Pockets Of Learning, contact us by completing and submitting the form below. If you are looking for a specif part number, please include it with your message.